"Making Weight" With Your RV - Escapees Mag Feature Article! “Making Weight” With Your RV – Escapees Magazine Feature Article! GVWR, GAWR, Pin Weight and GCWR — oof, what is all that stuff? 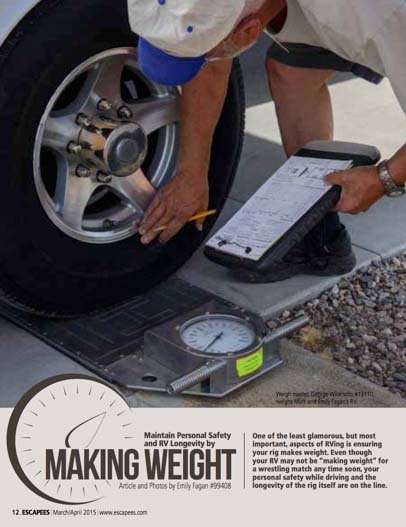 The March/April issue of Escapees Magazine features our article “Making Weight” which explains what to look for when you set out to weigh your RV. It’s easy enough to pull onto a truck scale to get an approximation of what your rig weighs, but it turns out that not all scales and weighing methods are the same. Also, for those who tow their rolling home behind them, deducing the pin weight of a trailer after getting the rig weighed can be very confusing. To address those RV weighing subtleties, Escapees RV Club offers a special program called Smart Weigh at several locations around the country. We had our buggy weighed at the Escapees North Ranch RV Park in Congress Arizona, and besides learning a lot about why weighing an RV is important, we were a little dismayed to discover that we needed to put our fiver on a diet! Join Escapees RV Club is a multi-faceted club that offers a huge range of services for RVers, from discount RV parks to rallies and gatherings of like-minded people (their big rally, Escapade, is taking place in Tucson right now! ), to their wonderful bi-monthly magazine, to domicile and mail forwarding services, to the SmartWeigh RV weighing program. Luckily for newcomers, the annual membership to Escapees has been reduced to $29.95 from nearly $60 in the past. We consider this a bargain to a part of an organization that supports our hobby and lifestyle and that publishes one of the finest RV magazines in the business. See more of our published work in the RV and sailing industry in our Press Room page. I’m so glad you found that little visual helpful, Sherry. I had the darnedest time trying to figure out how to explain pin weight in easy terms, and when I came up with the bathroom scale and the teenage kid image I was tickled, because it was so easy to visualize!! Thanks for letting me know! I had a feeling all the scales were different. When I weighed my truck, I recorded the number and after a week of not driving it, I went to a place to get it weighed and it was way different. I think you have to use multiple scales to get a fairly accurate number.